I cook food from all over the world. This sweet potato quinoa bake is my take on a Lebanese dish called “kibbeh”. My version is a really tasty, light and healthy dish. Sweet potatoes are highly nutritious and have a low GI-rating. Quinoa has a high protein content and is therefore a good choice for vegetarians. Actually, all the ingredients in this dish are highly nutritious (see Nutritional Information). 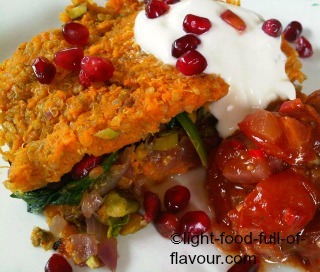 I serve this sweet potato quinoa bake with tomato chilli jam and yogurt with fresh mint. Note: Pomegranate molasses – used in this dish and other Middle Eastern dishes - has a sweet-tart flavour. It is sold in many supermarkets but if you can’t find it there, try specialist shops that sell Middle Eastern food. 1. Pre-heat the oven to 200C/fan 1800C/400F/gas mark 6. Place the diced sweet potato in a roasting tray. Add the oil, chilli flakes, a bit of salt and pepper and toss until well combined. Place the tray in the oven and roast for around 25 minutes – stir midway through – until tender. 2. Get the stock boiling, add the quinoa, stir and simmer without a lid for 15 minutes. Drain in a colander. 3. While the quinoa is simmering, place 1 tablespoon of oil and the chopped onion in a frying pan. Gently fry the chopped onion for around 10 minutes, stirring frequently to make sure the onion doesn’t burn. Once the onion is really soft, take the frying pan off the heat and mix in the pistachio nuts, spring onion, pomegranate molasses and season with some salt and pepper. 4. Use a potato masher to mash the oven-roasted sweet potato. Mix in the quinoa with the sweet potato mash. Spread out half of this mix in a lightly oiled oven-proof dish. Divide the onion mix on top, followed by the spinach and then the rest of the sweet potato and quinoa mix. 5. Place the sweet potato and quinoa bake in the oven and cook for around 15 minutes, until piping hot and slightly browned. If using, scatter some pomegranate seeds over each portion.